11 June: When I finally got through to my Turkish friends on Tuesday 4 June the worst of the fighting was over. 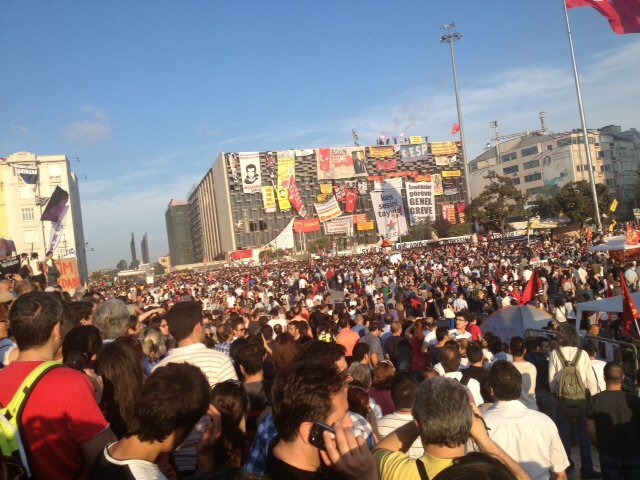 They reported that both Gezi park and Taksim, Istanbul’s great square, were in the hands of protestors. I went to witness this as soon as I could, arriving Thursday evening June 6 and stayed until Monday. It was a halcyon moment between the police withdrawal and their counter-attack this morning. Already, these notes are a record of what has been crushed. But its influence will live on [For the ongoing battle, see below.] It is a undoubtedly a turning point for Turkey - and therefore for both the Middle East and Europe whose directions will be shaped by a uniquely important and influential country. 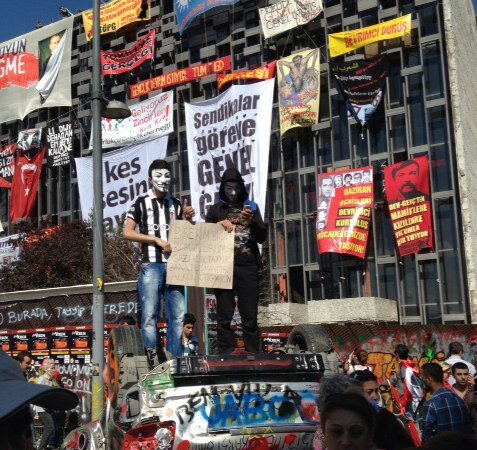 Istanbul's youth have joined the the city-centre occupations of Tahrir Square with Madrid, Athens and New York, and a generation has linked up to the fearless protests, at once highly political yet rejecting traditional political parties, that have erupted from Santiago to Delhi. 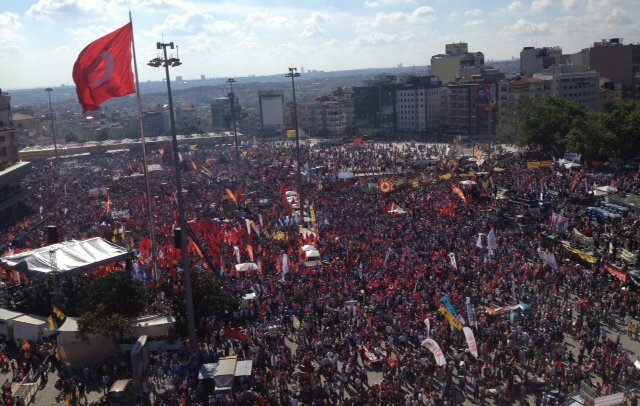 Taksim is very large and with Gezi park more than twice the size of Cairo’s Tahrir square. Filled to capacity it can hold over half a million people. This was the first thing that struck me, the huge spaces, the large numbers, the mobilization of groups, and the barricades themselves. If the immediate impact comes from the excitement, pleasure and freedom of being inside a ‘liberated space’ free of all police it is also immediately clear that Gezi Park is inside a larger area that has been fought for and won. On Friday 31st as the images of resistance to the gas and beatings flashed across the web thousands poured into the square to support the protestors and the police withdrew. Among many accounts, here is a cool one in English from Carole Woodall. Here are some pictures of barricades. You can see immediately that they were more symbolic than military. They allow people to pass by but not vehicles. They are not guarded or controlled. There is barricade tourism with visitors having themselves photographed beside them. They are not the front line between two opposing forces massed against each other, they exist because the police had withdrawn. Inside, and even right beside the barricades, expensive cake and coffee shops do a thriving business. When the police arrived at 5am this morning they did so on foot in very large numbers, walked through the barricades and then cleared the way for their riot vehicles. The leftists woke up in their homes and had then to get back into the square. A Turkish friend commented dryly that perhaps for the first time in the history of uprisings people stormed their own barricades from outside. Many of the news pictures of the fighting in Taksim are taken from the windows of the Marmara Hotel which towers over it on its south side. Looking from the hotel to your left is the famous monument to Atatürk that was covered in the banners of various competing groups, and behind this a huge expanse of road works and construction. 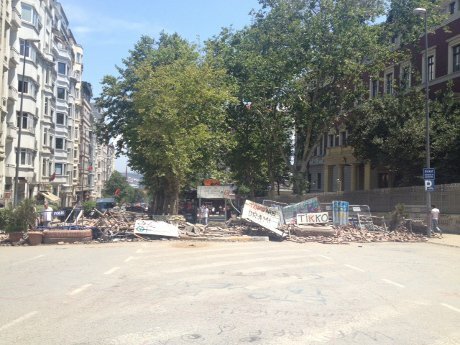 To the half-right are wide steps that lead up to Gezi Park. 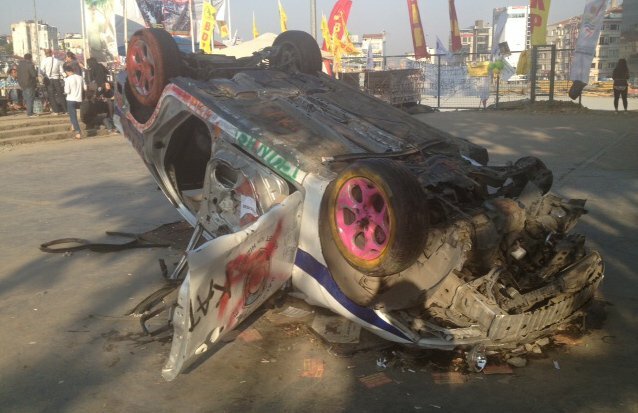 At the top of the steps some wrecked police vehicles became contemporary works of monument art, one of them plastered in messages of support, reportage and demands, often witty. 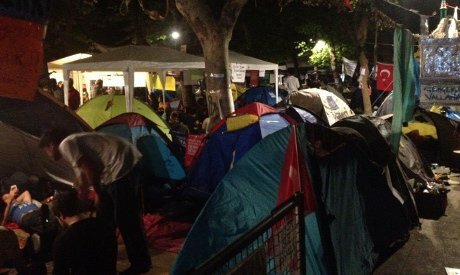 The park itself is covered with the tents of the protestors, mostly young middle-class with equal numbers of young women and men and a strikingly friendly atmosphere. Stalls give food to friendly lines of people, with a mixture of the clearly poor if not homeless joining in. There is lots of music and conversations and card games, with people clearing and cleaning or distributing gifts of support. 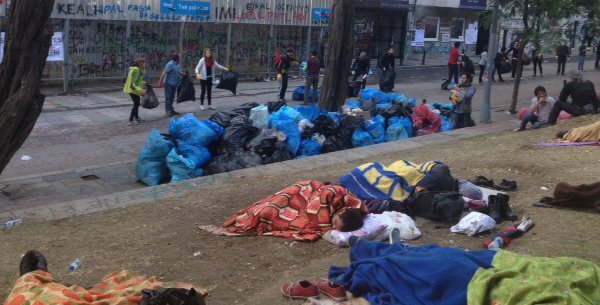 Protestors sleeping on Friday morning and clearing garbage in the background. In the square the political groups have their stalls and meetings. They also gather to chant and demand "Tayyip İstifa!" (Typpi resign! - Prime Minister Erdoğan’s name; it reminded me of people chanting “Maggie, Maggie, Maggie, Out, Out, Out” against Thatcher). Two political cultures coexisted, in the Square the traditional militants, while the occupants of the park personify the political culture that was not mobilized by old-fashioned sloganizing but seem to have beaten all world records in the use of Twitter and Facebook. A survey of 3,000 of the activists found 40% between the age of 19-25 and 24% between 26-30. Over half had never protested before most of whom did not feel close to any political party. Just over 80% described themselves as “libertarian” - 81.2%. Overwhelmingly they were there to stop police violence and demand respect for freedom, a third wanted a new political party. 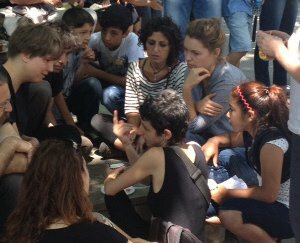 Here are two rough panoramas that illustrate the different energies of the 'commune' of Gezi Park and the mobilisation of Taksim Square. The self-organisation of medical aid, of solidarity stewards, of cleaning and clearing, was impressive in the way that self-organisation never fails to inspire. When everyone goes along with the basic rules of mutual support and non-violence, fear and hierarchy are not necessary (It is not that leaderlessness does not need leadership, but that it can find it.) Unlike Plaza del Sol and Occupy Wall Street, there was not a huge commitment to process or general assemblies. But a representative solidarity platform quickly emerged and agreed to this set of five demands. I arrived the same Thursday evening that the Prime Minister came back from an official visit to North Africa and declared that the occupation must stop immediately. On the Friday and Saturday, however, people poured into the Square, as pictures and messages broadcast the pleasures of an ongoing public gathering. None were obvious supporters of the ruling AKP but it was a show of social solidarity not a narrow political mobilization by the opposition CHP. 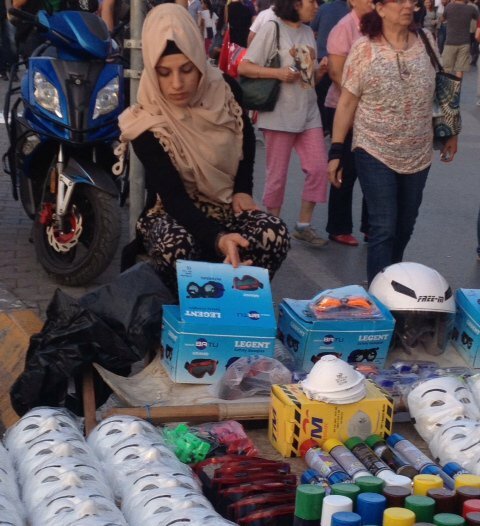 Families came, parents bought their children the famous V for Vendetta ‘Guy Fawkes’ mask (ironcally, an image of anonymous revenge on capitalist power has swiftly become a commodity as the masks were mass produced by the fast moving Istanbul street traders). On Saturday late afternoon the football supporters, Fenerbahçe with their yellow stripe, Galatasaray in red and yellow and Beşiktaş in black and white, with their legendary capacity for fighting the police as well as each other arrived to great shouts, cheers and chanting. The square was absolutely packed. If the organisers – but there are no leaders in the usual sense – had been able to hold onto this crowd the square would never have been retaken. The Culture Centre is a classic of late sixties modernism which overlooks Taksim. It is currently hollowed out for renovation, The occupiers who wanted to shout the loudest draped it in their many different icons. Here is what it looked like from below on Sunday. Erdoğan has vowed to dismantle it as the symbol of old order and replace it with an opera house “built in the baroque style”. His insistence that he can impose his architectural taste a sign of the derangement of presidential hubris that provoked the protest in the first place. On Sunday, thinking it would be a good place to get a perspective from the top, I followed some equally curious protestors through a hole in the fence, climbed through the building to the roof with its spectacular views of Istanbul and the crowd, gathering for music and speeches from a temporary stage created in the square. Going into the Cultural Center. By now Taksim had become a venue. The crowd was large but not as packed as Saturday when the football supporters packed it out. I listened to music and some hideous political rhetoric. In the evening the talk was of how to negotiate if possible, when the barricades would come down and if we could ensure the park would be protected... and the Prime Minister's increased bellicose and polarising response and whether this could be contained. It is when the army is withdrawn from political life, when the taboo about the Armenian Genocide is lifted, when it becomes possible to make peace with Kurdish nationalists that this movement announces the need for a new public culture based on recognition of difference and resemblance. While it is predominantly a secular movement, it does not embrace old State laicism and animosity against Islam. Rejecting the politics of polarization and stigmatization, the Gezi movement is reuniting people across ancient divides. The future of Turkish democracy resides in the credo of this movement which asks those in power hold their tongues, abstain from moral intrusions and ban violence. On the one hand, the streets and the social media become sites for a very diverse group to act together as a resisting crowd, raising their voices, asserting their agency to make their own decisions about their lives, their environment and public spaces and calling for freedom in their lifetimes. On the other hand, these platforms open up as sites for negotiation, encounter and dialogue between unfamiliar groups of Turkish youth. 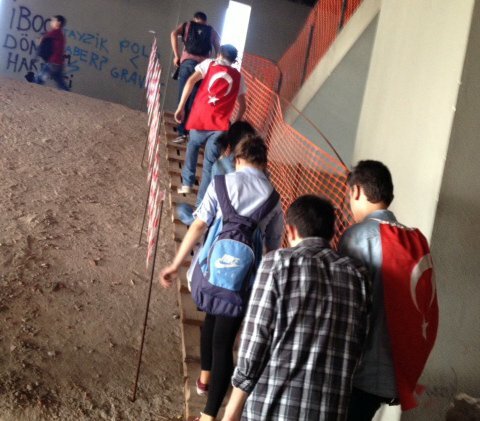 In other words, young protesters appropriate both the streets and the social media to bring forth a change to the political landscape of Turkey where their voices matter and where they also hear, see and speak with each other beyond the usual encounters trapped within the social boundaries of identities. Taksim has elements of Cairo’s Tahrir Square as well. The barricades for a start, as well as the personal opposition to the country’s leader - although not really his resignation despite the slogans, no one doubts Erdoğan was elected recently with a popular mandate and he is not threatening a family dictatorship like Mubarak. In Turkey the core aim is far more modest, to save the trees of Gezi Park from being replaced by a shopping mall and the reconstruction of an Ottoman barracks that no one can remember. This simple but hugely symbolic demand should be acceded. Predictably, Erdoğan told the Turkish Parliament today he will "not kneel down in front of these people". The language of fatuous male pride says it all. In fact he has been defeated by what he has achieved and by the wonderful spirits of the new generation. The immediate question is what price he will make them pay for his frustration. 14 June Here in London I can't report in detail on the developments since the riot police stormed back into Taksim. What is clear that governments and state authorities everywhere will study closely what happens and draw their lessons. What may baffle outsiders given the dramatic images of the police suppressing the protestors, which have flashed across the news this week, is how come the protest itself still continues? The answer is that they were crushed in the Square but not (yet) the Park thanks to the political and cultural difference between them that I have tried to describe. With his disparaging language and his ultimatums, Prime Minister Erdoğan attempted to polarise his supporters against both aspects of the protest. His real concern, however, was not the militants in Taksim Square who took advantage of its temporarily liberated space. 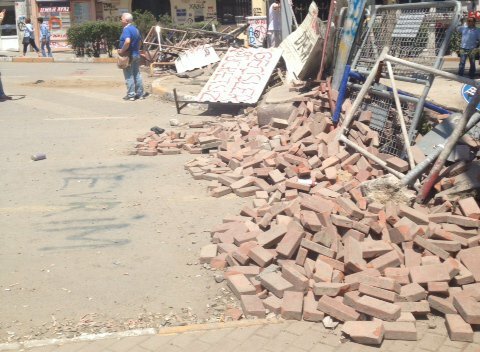 The police swept them aside quite easily, cleared the political stalls they had erected, took down the banners from the Ataturk Cultural Centre and dismantled the barricades, opening the roads to normal traffic. Unique images from a drone (presumably the one I photographed in the picture above, which is is said was shot down by a police helicopter) show the casual nature of the battle. Taksim Square has long been a site for historic confrontations with the regime by trade unions as well as far-left militants. This time the encounter was more spectacle than substance. 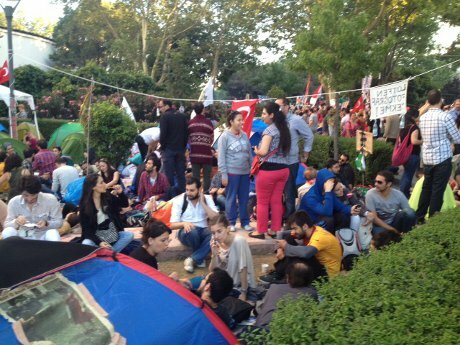 Erdoğan's forces have so far been held back, however, from a direct assault on the young people occupying Gezi Park, presumably for for fear of provoking a much greater conflict. The occupants had gas cannisters fired at them as they were surrounded - but they were not directly assaulted or removed. The children of an influential middle class they had seized a symbolic position by the side of Taksim – both out of the way yet also central – in the face of increasingly arbitrary and despotic policies. Their youth and 'unpolitical' background makes them representative not marginal (see this survey of more than 4,000 of them opens in Google docs). Their demand to save a park is wonderfully conservative. Their passion and spirit is non-violent. It was easy to make fun of Erdoğan's denunciation of them as Çapulcu, or casual looters especially as he began to refer to himself in the third person and how his patience was running out (a clear sign of the clinical condition of hubris David Owen has diagnosed as accompanying the “intoxication” of high office). Yet they are a new and not easily dismissed force in Turkish politics. ..this is completely different to the Arab Spring. We are not against a corrupt government (although they are corrupt). It is not about money, although we are not a rich country. We have double GDP per capita compared to Egypt or Tunisia. And It is not like Occupy Wall Street, although we don’t like the system either. It is something completely different, completely new to the world. This is not a revolution. This is a resistance movement of people towards a person who breaks their hearts, who exploits their sense of honour, who thinks he can dictate their lives. This is a resistance movement against his police forces, who use brutal force against people who are playing guitar and reading books as a way of protesting. This is an intelligent and educated crowd. Things people share on social media and chant in the streets are insightful and often hilariously funny as, fortunately, we have a great sense of irony.... This is a movement no one has been prepared for. Neither the USA, nor the UK has planned for it or understands it. We don’t want them to take part in our resistance. We know what they have been doing to our country for decades and refuse to take their money or become entangled in their power struggles in the East. 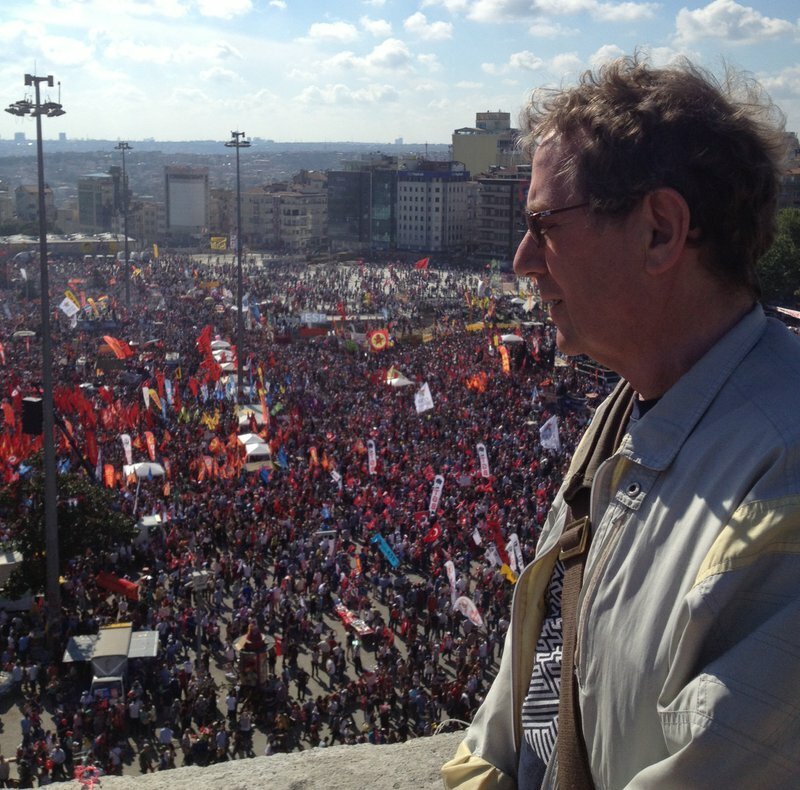 The challenge of Gezi presented Erdoğan with a choice. Either he could go down the route of a Putin and impose his rule by force or.... not. He was infuriated by claims of a 'Turkish Spring' with the implication that he was like a Murbarak and no better than an Arab dictator. He wanted to personify a new model of Middle Eastern democrat able to legitimately claim a place in Europe even if the Europeans didn't want his country. Driving this vanity was the energy and new wealth of Anatolian capitalism that he had unleashed, now making hay in the global market and with no appetite at all for the chilling effect of a Russian or Iranian outcome. Erdoğan had to accept his authority had reached its limit and he could not simply stamp out the Gezi Park occupation and build is Ottoman style shopping mall at will. Whatever happens the occupiers of the park can indeed claim to have won in this respect: Prime Minister Erdoğan is no longer unstoppable, his prejudices no longer the unquestionable projection of the future. The price of his insisting upon his arbitrary authority had become too high for his allies and his backers. “Right now the park is under rain, distress, and ultimately siege - as police are silently standing all around Taksim. Only a few hours ago we were wrecking our nerves over Erdoğan's ultimatum against the occupation – can we psychologically sustain another 20 hours of resistance against tear gas, plastic bullets and no sleep? We are splitting on how to respond to an offer of referendum between "reasonable" and "unreasonable"; between those who trust this Government, those who do not want to deal with this Government. Did you hear the words PRISM or full-spectrum surveillance being mention? Me neither. But this is what it is in part about. Data mining does not mean governments reading your emails, President Obama has assured us (without adding unless they decide they need to). It does mean their taking notice the whole time of who you communicate with and how often. What matters is not the individual but the collective intrusion involved with total oversight leading to the seductive potential to intervene pre-emptively encouraged by the companies that sell the systems that do this. Before you can say "Lets stop our local park from being sold off" to more than three people, there will be police at its gates. But they can't pre-empt all of us all of the time. 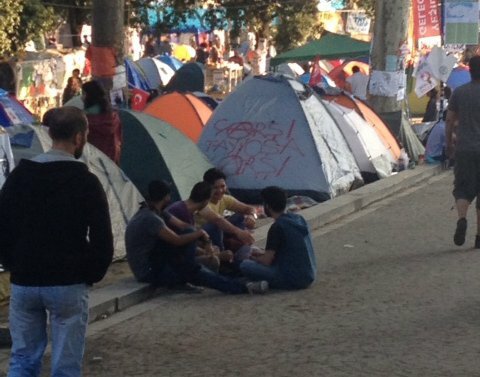 The commune of Gezi Park has set an example to the world: non-stop corporate commercialisation can be stopped even if, as yet, we have not learned how it can be reversed. Special thanks to Murat Belge, Burce Celik, Annalena di Giovanni, Osman Kavala, Tugrul Pasaoglu, Emma Sinclair-Webb and especially Andrew Hyde for publishing the images.